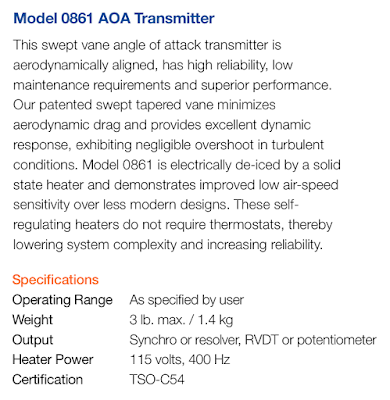 A common angle of attack transmitter (sensor) is an AoA vane, such as the UTC Aerospace (Rosemount) Model 0861. 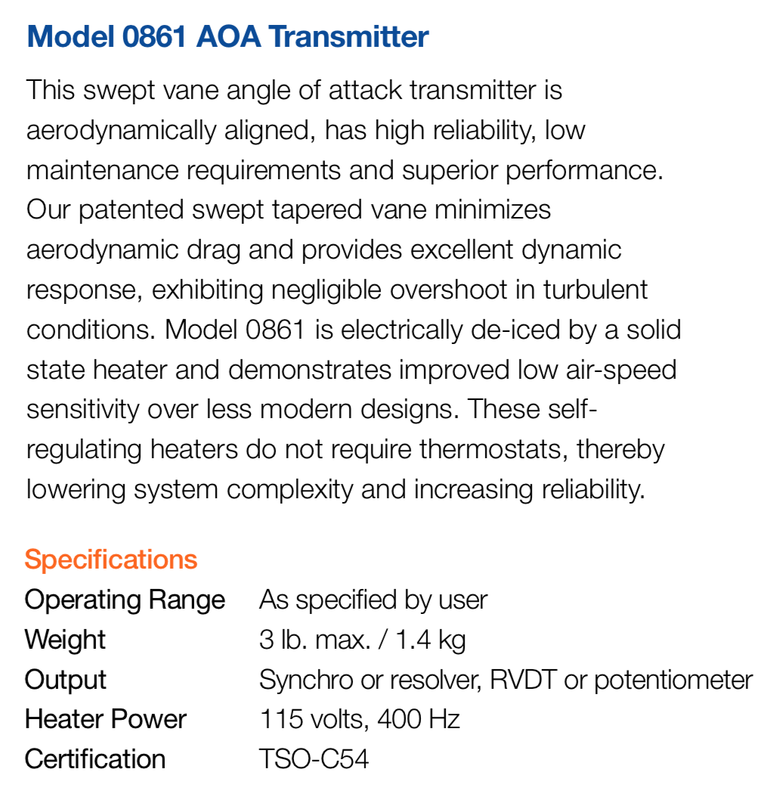 The UTC Aerospace Systems Model 0861 resembles the vane on the 737 MAX, but there is nothing available to confirm if this is the vane actually being used. 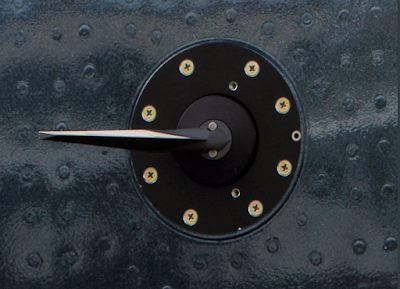 The angle of attack sensor is of the wind vane type. Its sensing element is a small wing which is positioned in the direction of the airflow. 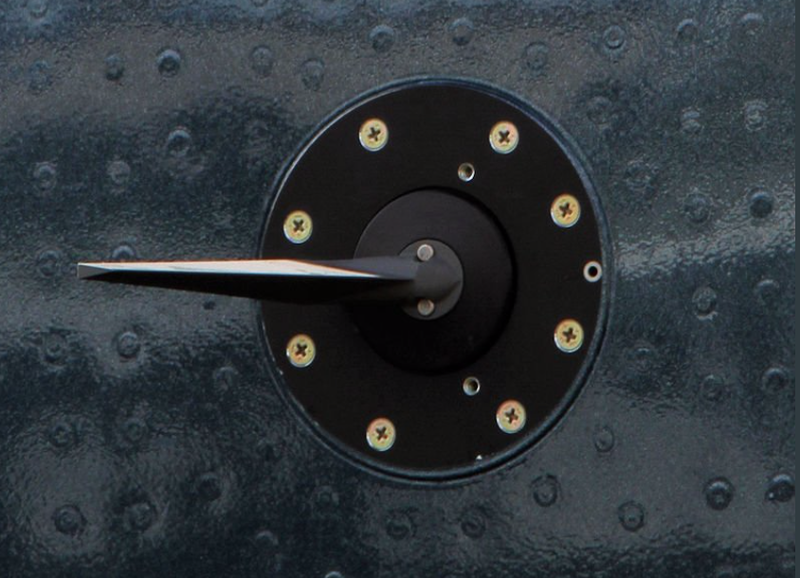 The small wing is mechanically linked to a free-turn shaft which drives the devices transmitting the local angle of attack signal. These transmitting devices are made up of resolver transformers which convert the angular information into proportional electrical information (angle sine and cosine). The whole mechanism is stabilized around the rotation axis. In addition, a damping device enables a satisfactory dynamic response to be obtained (filtering of mechanical oscillation). 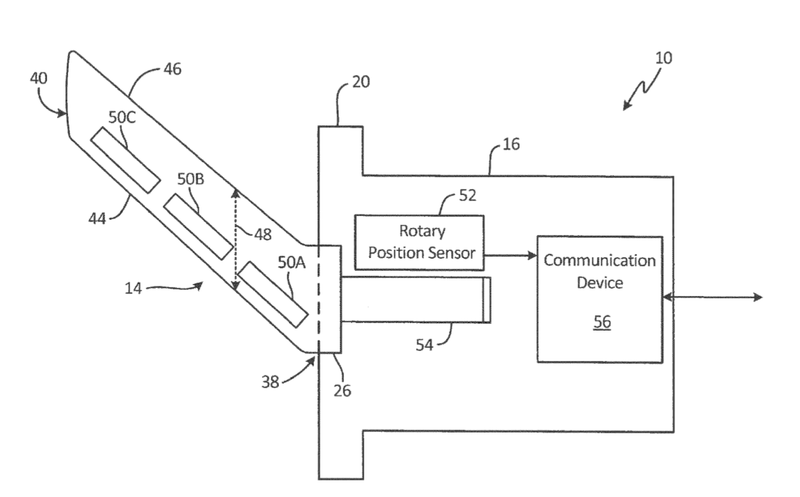 The 737NG Stall Management Yaw Damper (SMYD) is connected directly to the AoA vane using a resolver interface. NOTE: Limited drawings from 737NG maintenance manual are shown for information, under free use. Satcom.guru does not receive any revenue from this posting; they are provided at no charge for public information. A resolver is a form of sensor that relies on inductive coupling to two orthogonal pickups (SIN and COS). The outputs of the resolver are modulated by a reference carrier. Their output amplitudes relate to the shaft angle. Lion Air JT610 was a Boeing 737-8 (MAX), PK-LQP. 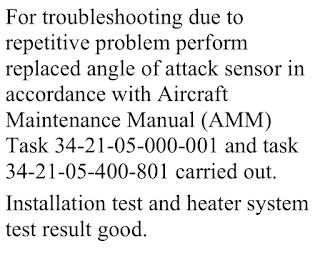 The interim accident report provides an entry that the Captain's AoA transmitter was replaced. The AoA vane data for the flight prior to JT610, and JT610, showed a significant error in the Captain's AoA measurement. The difference between the two measurements can be visualized by overlaying one on top of the other. This overlay shown below on the middle of the three traces. 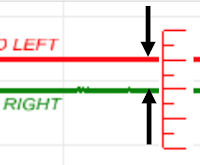 The overlay shows that the error between the left and the right remained fixed while the airplane was moving, but varies considerably when the airplane is still or at taxi speed. 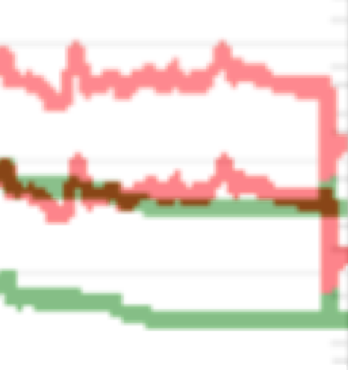 Prior to takeoff, the error between the left and right values increased (middle shown with Green (Right) above Red (Left) upon takeoff, where Red (left) error increased to the inflight value. The left AoA varies quite a bit while the right AoA is unchanged. There is some sort of upset prior to takeoff. The left AoA excursion is much greater than the right AoA excursion during the upset. After landing, the left AoA is much "noisier" than the right AoA. 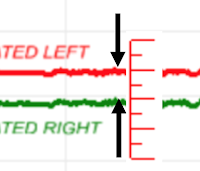 The right AoA smoothly settles into a minimal value, while the left AoA remains higher in offset than inflight, until the very end of the recording, where the left AoA drops much closer to the right AoA. In summary, for the Oct 28 flight, left AoA difference from right AoA was a constant of about 22 degrees inflight, but the error varied considerably while the airplane was moving slowly on the ground. Unlike the end of the prior flight, the Left AoA started out with greater than the inflight offset During taxi, the error closed to achieve a constant inflight offset. In summary, for the Oct 29 flight, left AoA difference from right AoA was a constant of about 22 degrees inflight, but the error varied considerably while the airplane was moving slowly on the ground prior to departure. A steady error of about 22 degrees (left above right) persisted on both flights while airborne. The error was both greater and less while on the ground. 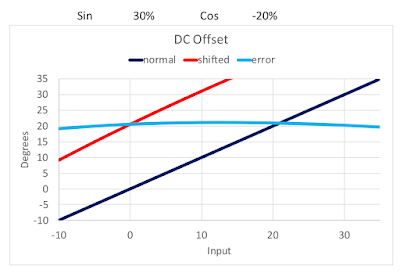 The SIN and COS resolver output amplitudes are measured together to calculate the shaft (AoA) angle. 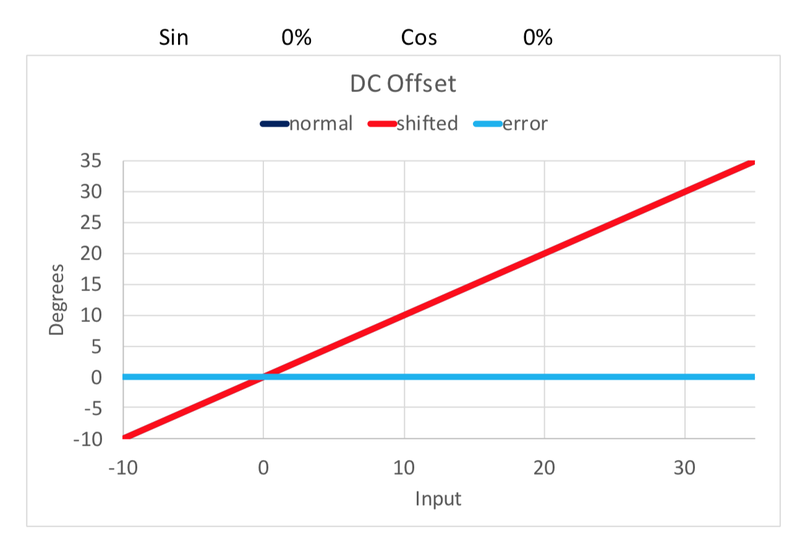 One source of error is a DC bias, or artificially boosting either the SIN or COS values with a constant amount. 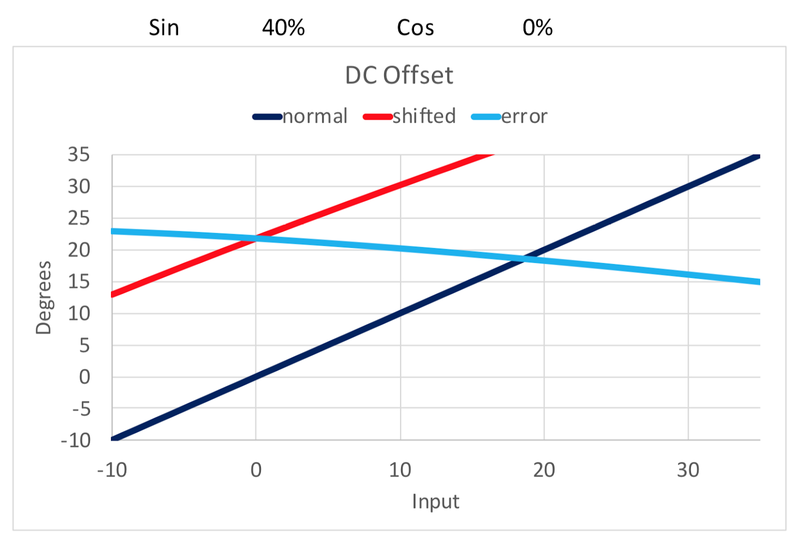 In the analog to digital conversion, the modulated SIN and COS values are measured. A DC bias is like adding a fixed value to the output of the conversion. Beginning with no error applied, the input and output would have no error. 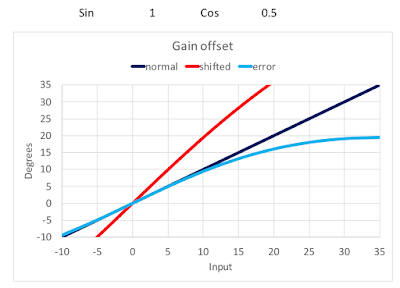 (normal is without a bias, shifted with with a bias). 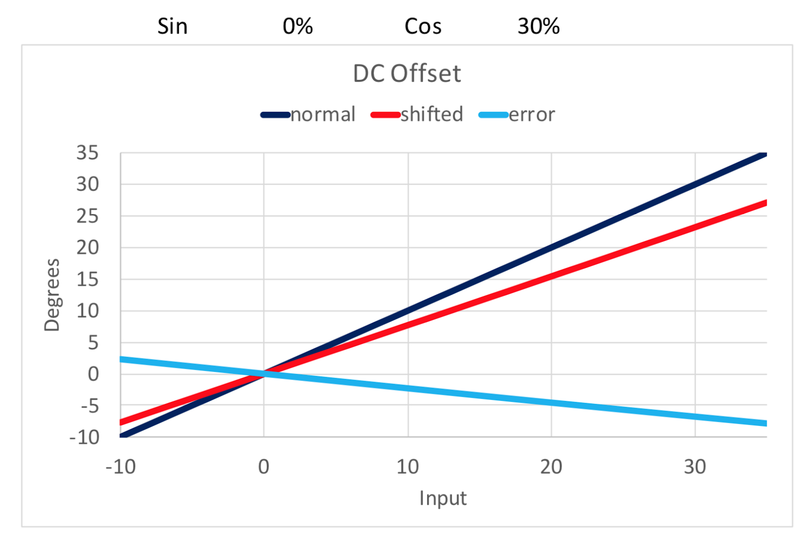 Adding a small offset to the SIN value creates about a 20 degree shifted output greater than normal. In this case, the offset is adding 40% to the measured maximum amplitude of the SIN output If SIN output maximum was +/-1.0, the offset is 0.4, or the output would range from -0.6 to 1.4. 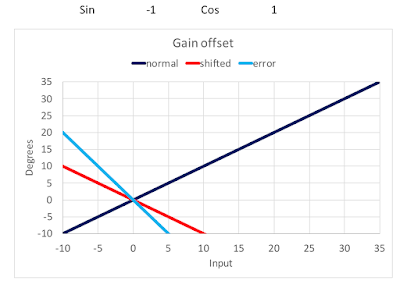 Positive offset to the SIN value causes the largest error at the lower angles decreasing as the angle increases. 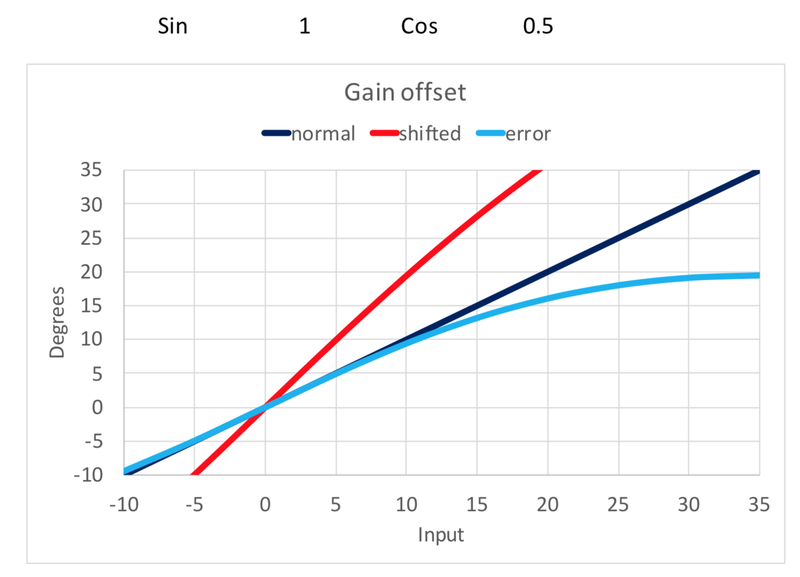 Positive offset to the COS value causes the largest error at the highest angles, increasing in magnitude as the angle increases, but where the shift is driving the output to be less than the normal value. 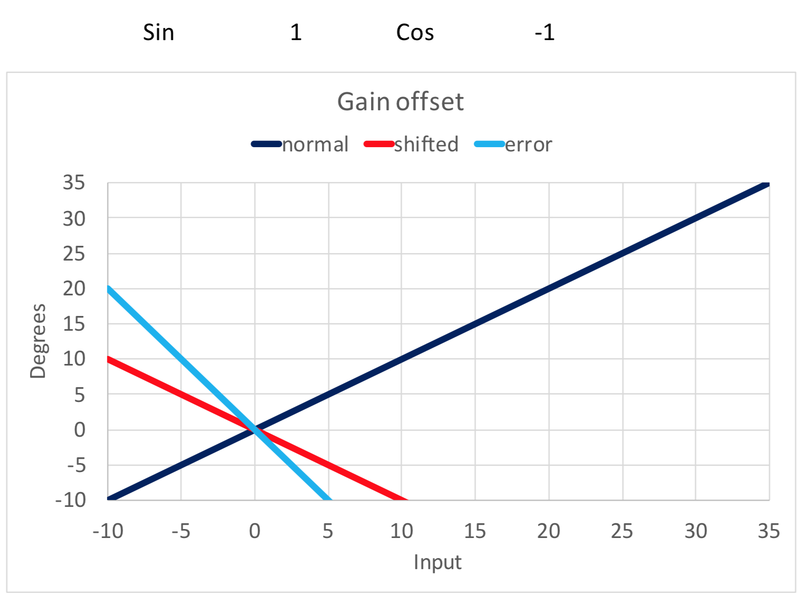 The reverse offset to SIN and to COS reverses their trends. 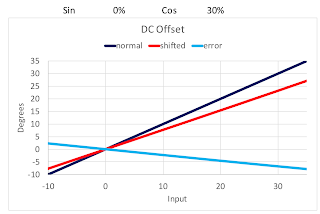 A combination of positive offset to SIN coupled with negative offset to COS can provide nearly a flat error. 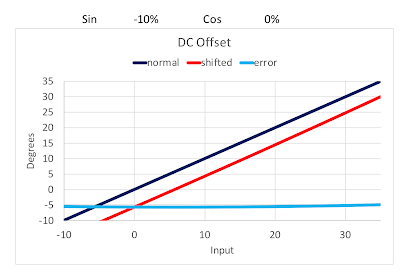 In summary, offsets to SIN and COS can cause shifts in the resolver output. These shifts either maintain nearly a constant value across the angular range, or vary continuously with the angle. 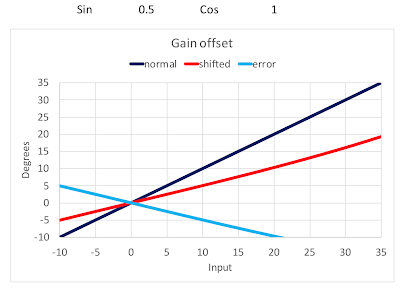 One source of error is gain, or scaling SIN or COS values non-uniformly. 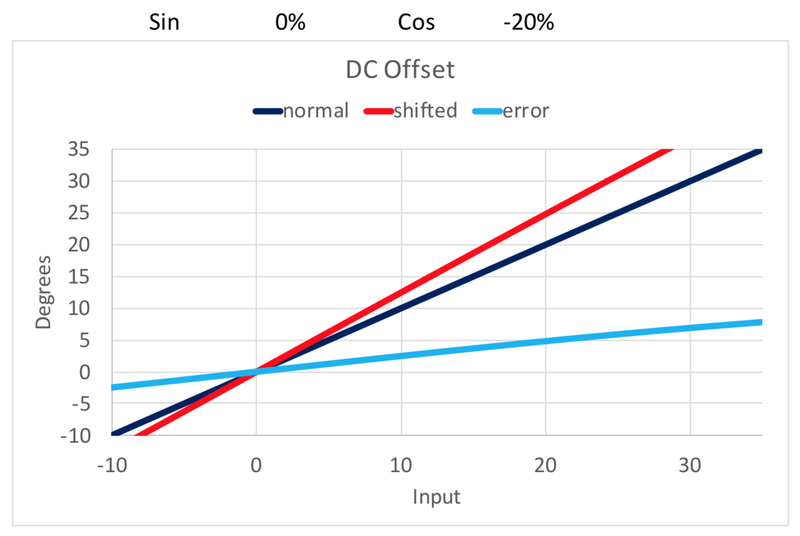 In the analog to digital conversion, the modulated SIN and COS values are measured. Gain is like multiplying a fixed value to the output of the conversion. 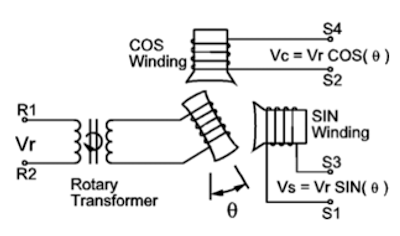 The SIN and COS voltages are created through inductive pickup. 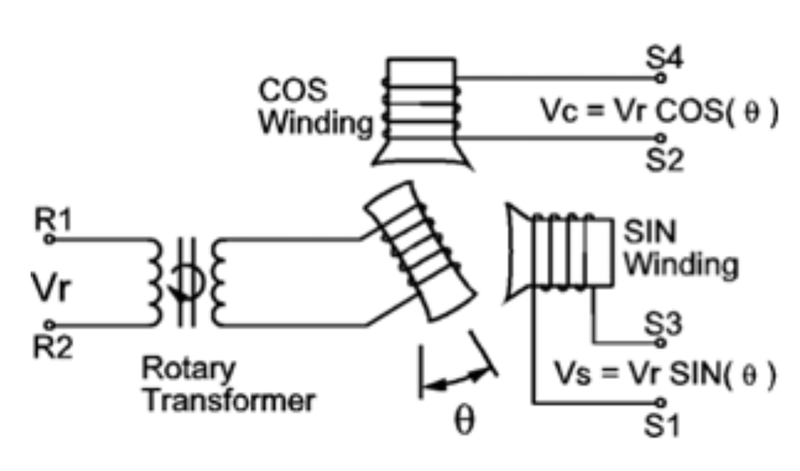 If the receiving coil is damaged such that not all coil turns are effective, then the gain can be reduced. 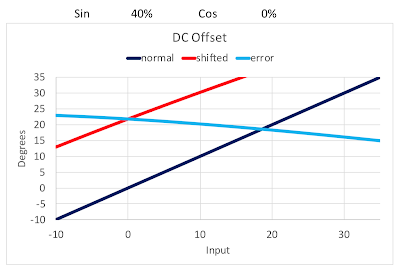 Similarly, the output gain can be reduced if the Analog to Digital converter loads the coil differently. If only half the gain was applied to the SIN value, the output shifts increases in the negative direction as the angle increases. 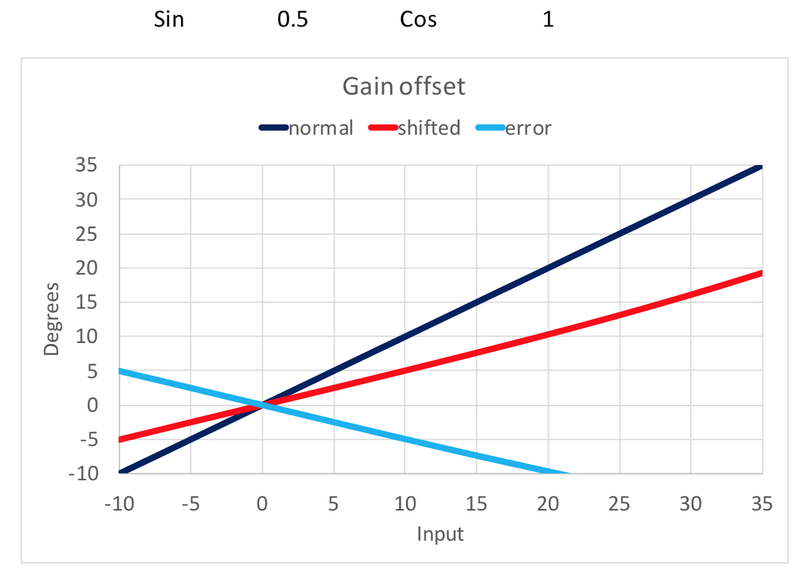 If the COS value is reduced to half its normal value, the output error increases to the positive as the angle increases. If the SIN is reversed on polarity, the output error shifts negative significantly as angle increases. 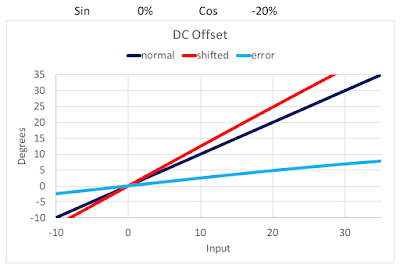 If the COS is reversed on polarity, the output error shifts negative significantly as angle increases. The only gain error that results in a positive error is reducing the COS signal. All other options lead to a negative error in the angular range of interest. The one combination of positive error from gain error exhibits considerable variation of error based on the angular value. There is no obvious gain error that leads to a constant positive output error. 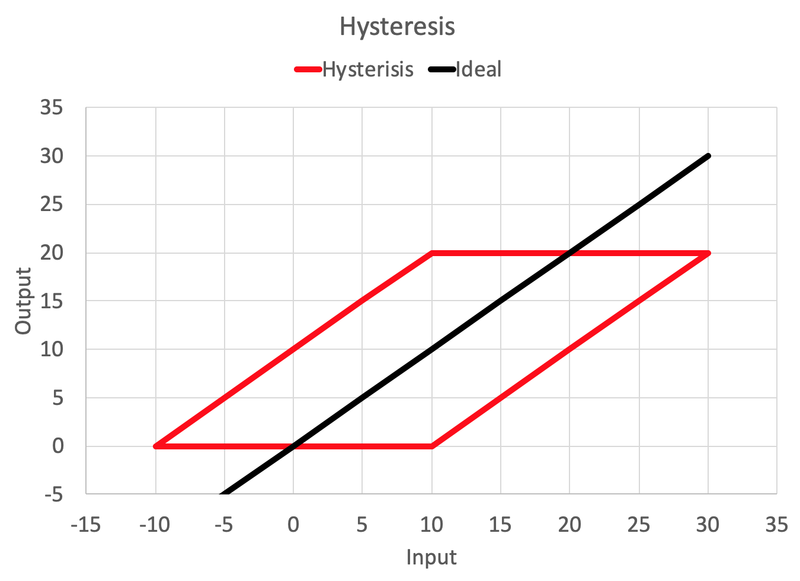 A hysteresis loop is driven by backlash. Starting with the backlash centered, the input shaft first moves positively across the backlash zone until encountering the output shaft and it then begins to move with the input. After moving forward, the input shaft is reversed in direction. The output shaft does not move until the input shaft has traveled across the backlash to encounter the output shaft on the "other side", at which point it follows the input. After moving backwards, the input shaft moves forward, once again traveling across the backlash before the output shaft starts to move. For a 20 degree error, the backlash would also have to about 20 degrees, but that would create no means for the output shaft to track the input shaft in any circumstance (the reversed motions would be lost). 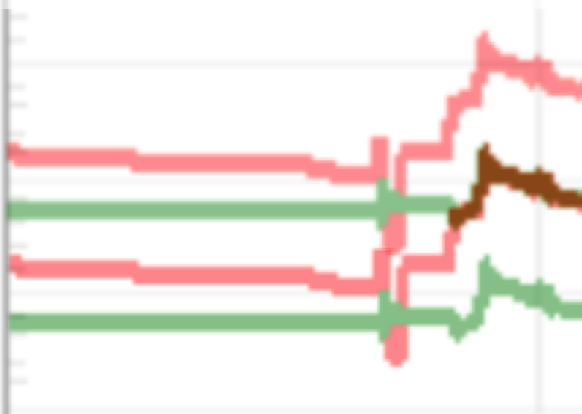 While the airplane was not moving fast enough to load the vane with air pressure, the left AoA varied both positively and negatively, and somewhat randomly. 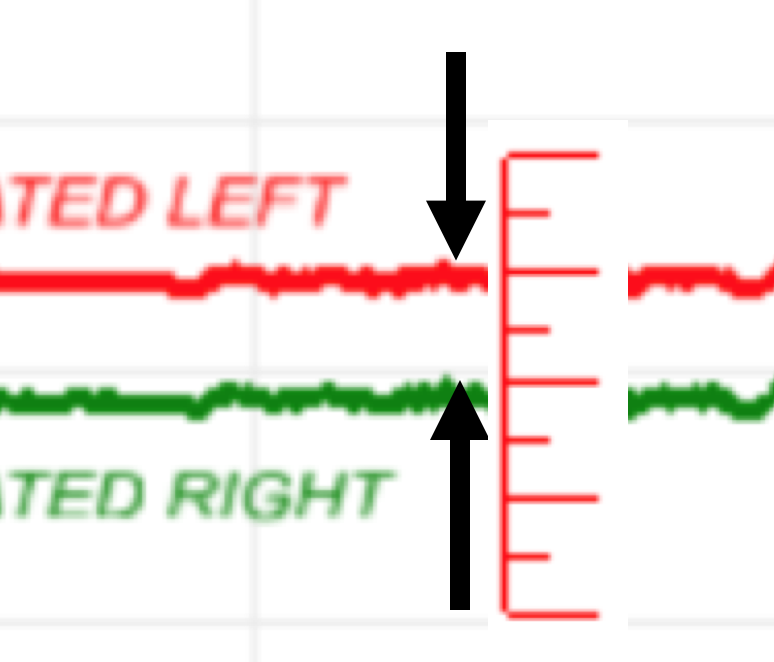 As soon as the velocity aligned the vane firmly to the free stream, the left AoA vane showed about a 22 degree positive offset to the right AoA vane, constantly. There is no obvious or simple electrical failure that can create these symptoms. Excessive backlash would have prevented the left AoA vane from tracking the right AoA vane inflight. There are vanes that offer a digital (ARINC 429) output, moving the resolver analog-to-digital conversion into the AoA transmitter. 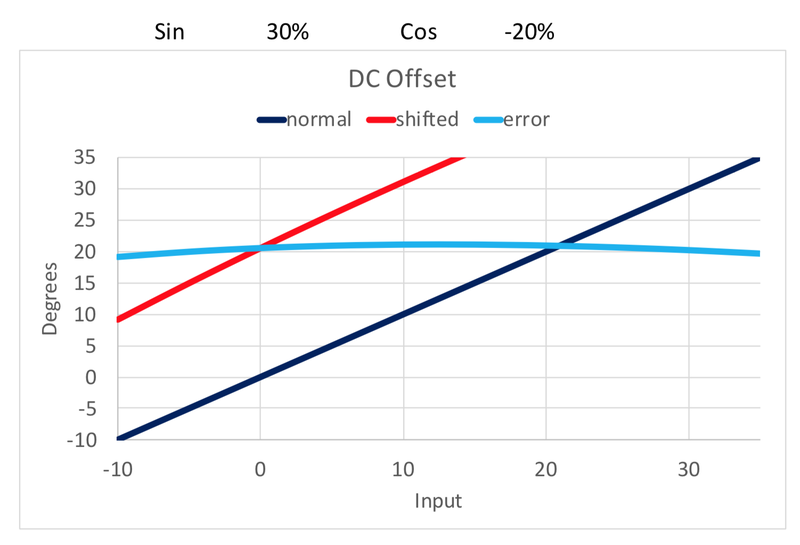 While it is possible that using an ARINC 429 interface, rather than SIN/COS analog resolver interface, has other failure modes to consider, there are none that would distinguish their influence based on whether the vane is loaded aerodynamically. The only other factor may be some form of internal mechanical failure between the vane and the resolver. 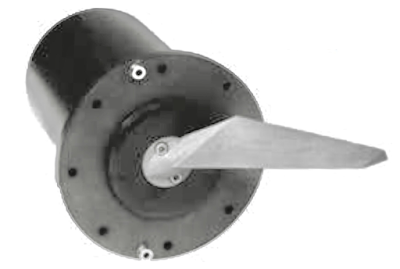 This failure allows the vane to flop about when not loaded aerodynamically, but then drops into a consistent fixed offset when the aerodynamic loads increase. This cannot be envisioned without looking specifically at the vane. The vane manufacturer will have much more insight into what might have contributed to these symptoms. Thanks for the suggestion. I still think it is a rosemount, but cannot be certain. I think it could be a bit different. I have no idea if you know exactly that this sensor is based on Resolver. I would expect that inside they have RVDT (which aero guys love for reason of weight) not Resolver. Then it could be an electrical bug. When phases of primary winding and phases of secondary winding is in more then 90deg shift there will be exactly that behaviour which we see here. 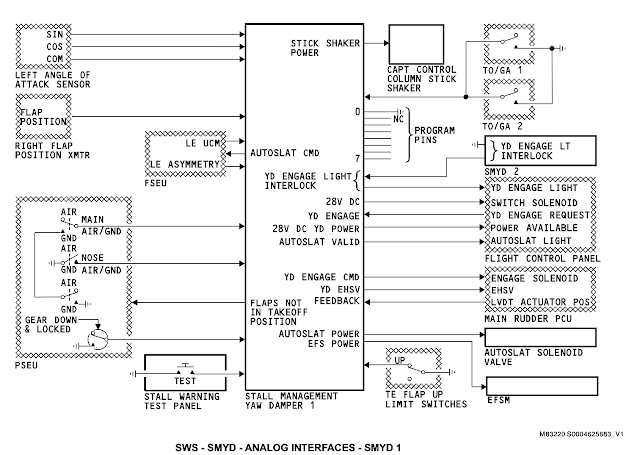 I showed the interface to the SMYD with SIN, COS, Common. that is a resolver. This is old-style tech. It is hard to understand what changed. I would not question the vane design, I think we have something else going on. I think it might be that for 737MAX they took 0861 with RVDT interface in order to save weight of 2 wires. Anyway I have no proof too. I just see +11 and -11 degrees which makes me think that only failure mode can be RVDT phases mismatch (Resolvers have same possible problem but will show +11deg and -79 deg). The other thing - I can't find out how this can be done mechanically. There is no doubt in vane design but in receiver electronics (i.e. SMYD). I struggle with a mechanical failure (rotation of the shaft to the sensors) but leave it to the designers to let us know (awaiting final report). 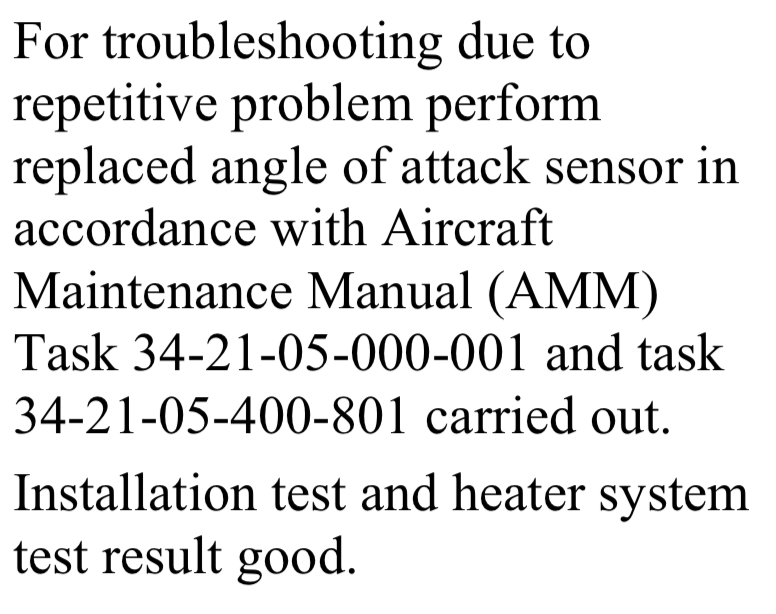 Having three AoA vanes fail seems hard to understand, especially with two installed back-back showing errors. The Indonesian final report will hopefully shed some light on this, as they have the first vane (removed) as a data point. I worry about the interfacing electronics. 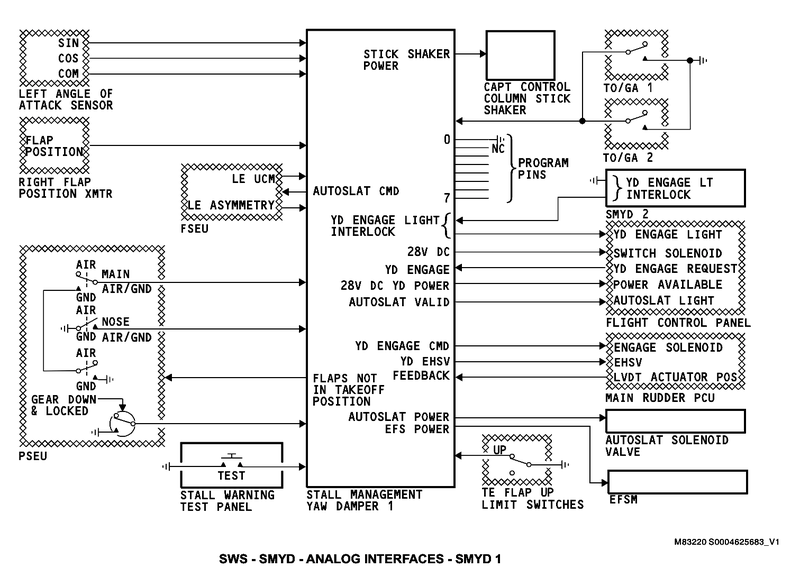 And it may be that in the MAX they changed the system so the the SMYD "function" receives AoA from the ADIRU over ARINC 429, rather than a local analog interface. More questions than answers. Why is the different input signal not filtered by automatics? 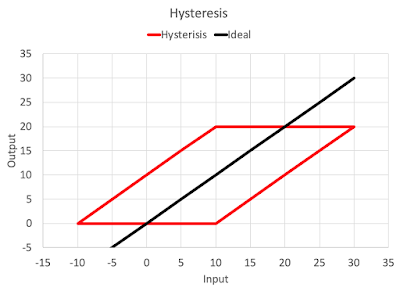 Why is there no cross validation? the airplane is designed with a left side and a right side. The idea is to keep them isolated so that one fault does not propagate to the other side. A fail-safe design shuts down the output if both side do not agree. As best I can tell, it only uses one AoA; it does not compare them. That will be one of the changes forthcoming (Fail-Safe). Thank you! As a developer of automated systems, I am shocked by this architecture. For hi-safety systems we usually use 4 (sometimes 3) sensors for each parameter and continuously compare data from them. If one of the sensors starts to show too high or too low data, we just reject the data from it and continue to work with the remaining sensors. I thought in aviation the same way. Now I'm an aerophobe. With my theory -> they both was heated too much by the sun and ran out of phase. Also I have a doubt they design and test receivers with knowledge of AoA cable length. But realy we need to wait for report it is only speculations now. I would temper any assertion of these vanes failing due to environmental factors. We have a great track record with environmental qualification. Cable length would have no factor with resolver, and I have shown that a bias or scaling error on one side does not result in a constant output bias. AGREED, we need to let the Indonesian final report tell us what they found.